Paddled the Erme at a above medium level on the Saturday followed by a quick blast down the Upper Dart by Vicky Andy McDoom and myself. Sunday featured a group paddle down the Upper again. 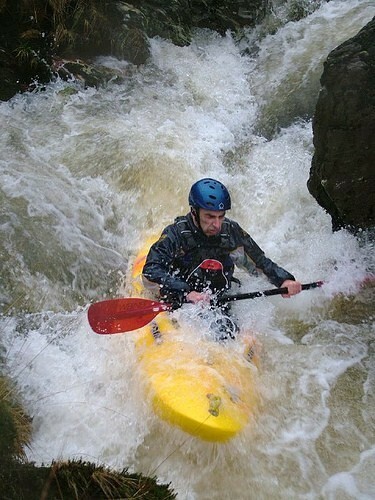 I don’t think I’ve paddled the river at this level before, it was fun! big waves with not to many sticky holes. Level: Above Medium, over the ledge but not into the next arch. Incidents: A couple of people took swims, Lisa found the levels a bit to high for her and decided to walk around Euthanasia and Surprise Surprise – fair enough. Notes:Apparently this was the first time Neal and Wendy had run this river which supprised me! Photos: Lee and Fred and Ben took some pics. If I can get copies of them I’ll link or post them. Post Paddling Activities: With the demise of paddling at the RDCP we stayed at the Dart Lodge by the petrol station on the edge of Ashburton. Very pleasant it was too. On-suite showers, a decent bar and restaurant led to a few to many beers being consumed. Notes:I think I’m falling in love with the Erme, maybe its just cause its new to me.